Even though aggregate crime rates have been trending dramatically down over the past two decades, the world feels like a dangerous place. Maybe you’re thinking of getting a gun for self-defense. Whether you intend to use it to protect your home or to carry it on your person (being careful to follow your state’s laws on the matter), there are some other things you’ve got to have. Here are the top five things that you need besides the gun itself. Also see: Thinking About Concealed Carry? Read This First! Yes, your gun is a tool that can be used to provide protection, but you also have to take steps to protect yourself and others from your gun. You’ll want at least three things right off the bat. Proper impact-resistant safety glasses are a must every time you press the trigger of a gun. Most of us are only issued one set of eyes, so it’s important to protect them from hot and sharp debris. Bullet fragments can bounce straight back at you. Ammunition generates hot, fast-moving gasses filled with grit. While most of it goes forward, some can head back toward your face in rare circumstances. You’ll also need proper hearing protection. Every single shot you fire without using hearing protection will permanently damage your hearing. Let me repeat that. Every single shot will cause irreversible damage if you don’t protect your ears. 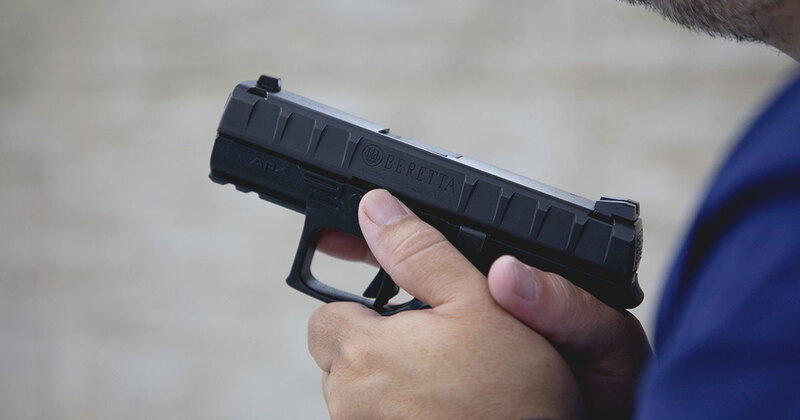 Good “ears” are surprisingly affordable but if you want to go fancy, check out the new Beretta Off-Shot Electronic Ear Plugs with Bluetooth. Last but not least, you’ll want to be able to secure your handgun from unauthorized use. Whether you have kids or guests in your residence, it’s a good habit to lock up your gun so others can’t handle it. You can be efficient and use a hard travel case with simple padlocks. That serves multiple purposes and is effective. Even if you don't plan to carry your gun during your daily travels, you’ll still need a quality holster. Why? Training. If you go to a class (which you will, right? ), you’ll need a holster. Hold that thought for a minute because training is the final item on our list of needs. But, while we’re on the subject, don’t under any circumstance try to save a few pennies on a sub-par holster. Investing in a quality pistol and pairing it with a big-box-store holster is like putting reclaimed french fry oil into a 1962 Ferrari 250 GTO. A quality holster needs to do three things. It must protect the trigger against unplanned movement while the pistol is holstered. It must keep the handgun secured to your body through a range of physical activity. It must present the gun easily and consistently when you most need it. While there are other important “nice to have” features, these are the absolute minimum requirements. Since this article is about defensive gun use, you’ll need a separate flashlight. Most defensive gun uses are at night, so illumination is a must for looking and shooting. Even if you mount weapon light to your pistol that’s capable of illuminating Las Vegas, you’ll need a separate flashlight for searching. Pistol-mounted lights are great for shooting but terrible for looking. Gun safety rule number three reminds us to never point a gun at something we don’t want to destroy. If we’re looking, then we don’t know what’s out there (yet) by definition. Always use a separate flashlight to navigate and search. Use a weapon light only when you’re ready to shoot. Self-defense ammo is designed to make the very most from relatively weak pistol rounds. When you remove the Hollywood factor, handguns really only do one thing. They make holes in whatever you shoot. They’re not magic fight stoppers. They may or may not stop a determined attacker in enough time to help you escape or survive. The whole point of quality defensive ammo is to make the most of those relatively small holes. That’s why most self-defense ammo uses some form of hollow point design. If an expanding bullet can make a hole 1.5 to 2x larger than it’s original diameter, that helps increase its effectiveness. If you've ever wondered about 'knock-down' power of ammo, read this. Once you’ve selected the right ammo for your needs, you’re going to need to make an initial investment in a couple of hundred rounds of testing to make sure that it’s 100% compatible with your specific pistol. If your ammo and pistol combination misfeeds once per magazine or even once every 50 or so rounds, that’s something you’ll want to find out on the range. It'll cost you some money, but remember, we are talking about life and death here. In self-defense encounters, no one “rises to the occasion.” Sure, you may find the willpower to fight that you never knew you had, but you won’t spontaneously generate skills in the middle of a struggle. In fact, you’ll most likely execute whatever proficiency you’ve already developed in a dramatically reduced capacity. Simply put, you’ll almost certainly drop back to your lowest level of performance from previous training and practice. We used two words to describe this last step: training and practice. They are different things. Think of training as learning a new skill. Practice is just what it says - repetition of that learned skill until you get it right. Actually, that definition still falls short. Practice is not something you should do until you get something right; it’s something you need to do until you can’t mess it up. Fortunately, there are lots of ways to get reputable training. Reputable is the key word because there's plenty of bad information out there on the web. To start shifting your brain into a solid training gear, you might start with video learning. The National Shooting Sports Foundation produces lots of training videos on a wide variety of shooting topics. From such a qualified source, you know the information you’re getting is reliable. Video is a good start for background education, but if you’re serious about using for self-defense, then you need live, instructor-led training. If you had to take a state-mandated class to get your concealed carry permit, that’s rarely enough to qualify as defensive training. While some schools go above and beyond, most state CCW programs offer the bare minimum of legal and procedural training with minimal if any proper range instruction. There are clubs and commercial enterprises that provide concealed carry and defensive handgun training across the country so you probably won’t need to travel. Do your homework before you commit. The best way to evaluate a training class is to talk to knowledgeable students who have gone through it before.